A chef is only as good as their knife skills! 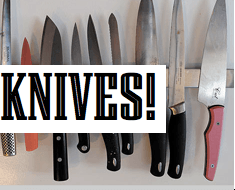 Join Jared Ingersoll from Dank St Depot and as he demonstrates the finer points of knife use, care and safety and explains what all those chopping words like julienne really mean. This hands-on course will help you be more comfortable in the kitchen and keep your fingers intact (and make you look infinitely cooler when you have dinner guests). Bring in your favourite knife with you on the night. If you don’t have one, we’ll have some for sale.